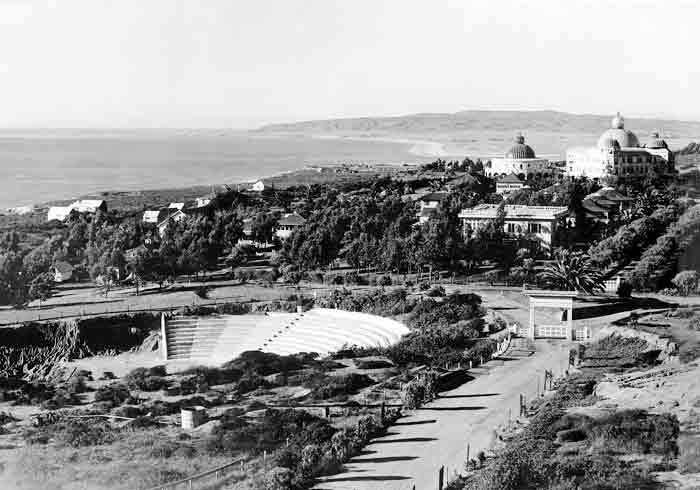 The present campus of Point Loma Nazarene University in San Diego, CA was first established in 1897 as the Point Loma Universal Brotherhood and Theosophical Society Homestead – also known as Lomaland – an educational site of the Theosophical Society of America. Subsequent to its foreclosure in 1941, the Point Loma campus has been occupied by Balboa University (1950), California Western College (1952) and the United States International University (1968) – the same university with changed names. In 1998, Point Loma Nazarene College was renamed Point Loma Nazarene University (PLNU). In 2001, H. B. London, cousin of James Dobson and executive of FOTF, was Master of Ceremony for the PLNU Alumni Association “farewell to the [Pasadena] campus” event. The following Timelines show the interactivity between the Theosophical Society, Point Loma Nazarene University [PLNU] and Focus on the Family. 1902 - Dr. Bresee founded Pacific Bible College in Los Angeles, California to train ministerial and lay leadership for the new denomination. Pacific Bible College is the predecessor of Point Loma Nazarene University. 1910 - Pacific Bible College purchased the Hugus Ranch property in Pasadena, California, and moved the campus to the Pasadena site. The school included liberal arts and grew as Pasadena College. 1973 - Pasadena College was relocated on the historic Point Loma peninsula in San Diego where it thrived for ten years as Point Loma College: An Institution of the Church of the Nazarene. 1983 - Point Loma College: An Institution of the Church of the Nazarene was changed to Point Loma Nazarene College. 1998 - Point Loma Nazarene College was changed to Point Loma Nazarene University. Point Loma Nazarene University is the official University of the Southwest Educational Region of the Church of the Nazarene. The relationship of the University and the Church of the Nazarene is characterized by a mutual commitment to the doctrine and mission. The Church of the Nazarene is an international Protestant denomination in the holiness tradition. The Church is firmly Wesleyan in doctrine and evangelical in mission. Its polity is representative. Emphasis is given to the conversion of sinners, the entire sanctification of believers, and the spreading of the gospel to every person. The Church is a member of the Christian Holiness Association and the National Association of Evangelicals. September 30, 1999 - Church of the Nazarene Joins the World Methodist Council. (Wikipedia) The World Methodist Council is a member of the interfaith World Council of Churches, which is a non-governmental organization (NGO) of the United Nations. The Oxford Institute is the Oxford Institute of Methodist Theological Studies at Oxford University in England. 1896 - Katherine Tingley was recognized successor to William Q. Judge, Vice President of the TS and General Secretary of its American Section, with international headquarters at first in New York City. Willim Q. Judge had succeeded Annie Besant and Henry Steel Olcott who had co-founded the Theosophical Society with H. P. Blavatsky. 1900 - Tingley moved the international headquarters to Point Loma, California, where she established the Raja-Yoga School, Academy and College; Theosophical University; and the School for the Revival of the Lost Mysteries of Antiquity. 1909 - group spearheaded by Robert Crosbie formed another major theosophical association, the United Lodge of Theosophists, based in Los Angeles, California. 1919 - Tingley founded aforesaid Theosophical University. Tingley died in 1929. 1945 - Colonel Arthur L. Conger was recognized as leader of the Society. He concentrated on expanding the publishing program and restarting the work in Europe after W.W.II. He closed the Esoteric Section of the Society and moved the International Headquarters of the Society to Pasadena, California. 1895 - Dr. Phineas F. Bresee, a minister of the Methodist Episcopal Church, and Dr. J.P. Widney, a Methodist layman and former President of the University of Southern California, founded the Church of the Nazarene in Los Angeles. 1896 - Katherine Tingley was recognized successor to Willaim Q. Judge, Vice President of the TS and General Secretary of its American Section, with international headquarters at first in New York City. 1899 - Andrew Carnegie donated $60,000 to build San Diego Public Library. 1900 - Tingley moved the international headquarters of the Theosophical Society to Point Loma, California, where she established the Raja-Yoga School, Academy and College; Theosophical University; and the School for the Revival of the Lost Mysteries of Antiquity. 1909 - A group spearheaded by Robert Crosbie formed another major theosophical association, the United Lodge of Theosophists, based in Los Angeles, California. 1929 - Death of Katherine Tingley, who was succeeded by Dr. Gottfried de Purucker who changed name to Theosophical Society. 1932 - Colonel Arthur L. Conger elected president of American Section of Theosophical Society. 1941/1942 – International TS Headquarters relocated from Point Loma to Los Angeles County near Covina. 1950-52 - Point Loma site of the Theosophical Society became Balboa University. 1968 - James Dobson returned to PLNU to coach tennis. 1968 - California Western University's name was changed to United States International University (USIU), but the law school retained its name as California Western. Pasadena College [Point Loma Nazarene College] sold 38+ acres of land in Pasadena to the U.S. Center for World Mission. 1983 - Name of Pasadena College was changed to Point Loma Nazarene College. 1998 - Point Loma Nazarene College was renamed Point Loma Nazarene University. 2001 - On February 3 will be the Pasadena/Point Loma Alumni Association “farewell to the campus” event. Pasadena satellite campus of Point Loma Nazarene University will be relocating to Arcadia, CA. The Master of Ceremony will be PLNU alumnus, trustee and D.D., H.B. London -- who is also the cousin of James Dobson, FOTF executive, member of the Steering Committee of Richard Foster's Renovaré, and speaker at the Robert Schuller Institute. H. B London, Jr. is Vice President of Ministry Outreach/Pastoral Ministries for Focus on the Family. A fourth generation minister, Rev. London was born in Little Rock, Arkansas. He is a graduate of Pasadena College. Rev. London was ordained in 1962 and in 1990 was conferred by PLNU the Doctor of Divinity degree. Rev. London pastored for 31 years, most recently the 3200-member congregation of Pasadena First Church of the Nazarene (1985-1991). He has served as a trustee at Nazarene Bible College, Point Loma Nazarene College and Nazarene Theological Seminary. He hosted a daily radio program "Lifeline to Truth" for 14 years in Salem, Oregon, and for 6 years in the Los Angeles area. He also had a weekly television program, "A New Way to Live" in Portland, Oregon. I have in my tape files a copy of James Dobson addressing his key management persons...the board of directors meeting at which time it had been decided likely that he and Chuck Colson would as early as 1997, perhaps even hold meetings calling the nation back to righteousness. Actually, it is an ecumenist move. He detailed that Focus on the Family, while the staff did not necessarily understand the larger picture, needed to know, had a plan. Then he paused, and then he said – “A global plan”. He went on to explain that this would begin with a meeting of America's larger church pastors and then at a later time, they would meet with smaller church pastors, this perhaps in groups. He didn’t go into much detail of that. One of the groups that they had hoped to meet with was the Liberal Catholic Church. Now he did not state this, when he was talking to his key personnel, this came out a little later in the letters that were sent. These letters were letters of invitation to pastors in the United States. At least two letters were sent, they were sent, as I earlier mentioned to America's largest church pastors and specifically to representatives of the Liberal Catholic Church. These letters were sent out by H.B. London, vice president of New Ministry Outreach and Pastoral Ministries for Focus on the Family. London is the cousin of James Dobson. All who attended this one-day meeting, they would come in, they would be put up overnight at Focus’ expense in a hotel or motel and their meals would be furnished. The meetings were to have taken place on Monday August 26th through Tuesday August 27th. It never happened, possibly because the ‘word’ got out. Focus on the Family went so far as to plead with the representatives of the Liberal Catholic Church to join them for what would be a “memorable event”, and if they couldn’t, please send representatives in their place - two designated representatives - this is the exact quote. Now I want you to take a look at what the Liberal Catholic Church is, and then I have a question - why was James Dobson trying to involve with leading American pastors, people from the Liberal Catholic Church. Ecumenism, I would say to the “nth” degree. Here are some of the publications I think, to begin with. The Goddess Religions, Gnostic Christianity, Eastern Mysticism, Mystical States of Consciousness, Reincarnation in Christianity?, The Feminine Aspect of Divinity. They also have a booklet of course, on meditation. They say its mystical approach to Christianity represents the position of the Liberal Catholic Church. They also emphasize the commonality of all religions. I wonder if they mean “extra-Biblical”? And even demands to reinterpret our own faith, the prime task of those in Christian ministry today is to help people evolve. The cultural Christians have to evolve along with the universe or perish. “If the Cosmic Christ is saying anything to us today, it is “evolve or perish” They go on to say that every man is a potential “Christ”. “[I]n the Roman Church it is held that a bishop cannot be deprived of his episcopal powers even if he is excommunicated for some major offense. It follows that he can still consecrate other bishops whose orders will be technically valid; hence that he can indeed start up his private branches of the Church at will. The result has been the emergence of a sort of 'Catholic Protestantism' in which schismatics can make nonsense of canon law. From The Point Loma Community in California 1897-1942: A Theosophical Experiment, Emmet Greenwalt, University of California Press, 1955. The term “Theosophy” is derived from the Greek words for “god” (theos) and “wisdom” (sophia) and means “divine wisdom.” Theosophy teaches that the hidden knowledge or esoteric wisdom of ancient pagan religions is able to teach individuals this “divine wisdom,” which is also called enlightenment or illumination; and that by acquiring this hidden knowledge (gnosis) of the ancient mysteries, an initiate may attain immortality or eternal salvation. Blavatsky wrote that the universal “religion of the ancients” was the worship of the Dragon and the Sun. The following excerpt from other writings of Helena Blavatsky reveals her contempt for Jesus Christ, Christianity and the Word of God, and her determination to eradicate the Scriptures as they were originally written and to revise and reinterpret them according to the secret doctrine of the Ancient Wisdom religion. “The worship of the dead-letter in the Bible is but one more form of idolatry, nothing better. A fundamental dogma of faith cannot exist under a double-faced Janus form. ‘Justification’ by Christ cannot be achieved at one's choice and fancy, either by ‘faith’ or by ‘works’ and James, therefore (ii., 25), contradicting Paul (Heb. xi., 31), and vice versa, one of them must be wrong. Hence, the Bible is not the ‘Word of God,’ but contains at best the words of fallible men and imperfect teachers. Yet read esoterically, it does contain, if not the whole truth, still, ‘nothing but the truth,’ under whatever allegorical garb. Only: Quot homines tot sententiœ. “Belief in the Bible literally, and in a carnalised Christ, will not last a quarter of a century longer. The Churches will have to part with their cherished dogmas, or the 20th century will witness the downfall and ruin of all Christendom, and with it, belief even in a Christos, as pure Spirit. The very name has now become obnoxious, and theological Christianity must die out, never to resurrect again in its present form. This, in itself, would be the happiest solution of all, were there no danger from the natural reaction which is sure to follow: crass materialism will be the consequence and the result of centuries of blind faith, unless the loss of old ideals is replaced by other ideals, unassailable, because universal, and built on the rock of eternal truths, instead of the shifting sands of human fancy. Pure immateriality must replace, in the end, the terrible anthropomorphism of those ideals in the conceptions of our modern dogmatists. Otherwise, why should Christian dogmas—the perfect counterpart of those belonging to other exoteric and pagan religions—claim any superiority? The bodies of all these were built upon the same astronomical and physiological (or phallic) symbols. Astrologically, every religious dogma the world over, may be traced to, and located in, the Zodiacal signs and the Sun. And so long as the science of comparative symbology or any theology has only two keys to open the mysteries of religious dogmas—and these two only very partially mastered, how can a line of demarcation be drawn, or any difference made between the religions of say, Chrishna and Christ, between salvation through the blood of the ‘first-born primeval male’ of one faith, and that of the ‘only begotten Son’ of the other, far younger, religion? “Study the Vedas; read even the superficial, often disfigured writings of our great Orientalists, and think over what you will have learnt. Behold Brahmans, Egyptian Hierophants, and Chaldean Magi, teaching several thousand years before our era that the gods themselves had been only mortals (in previous births) until they won their immortality by offering their blood to their Supreme God or chief. The ‘Book of the Dead,’ teaches that mortal man ‘became one with the gods through an interflow of a common life in the common blood of the two.' Mortals gave the blood of their first-born sons in sacrifice to the Gods. In his Hinduism, p. 35, Professor Monier Williams, translating from the Taitiriya Brâhmana, writes:—'By means of the sacrifice the gods obtained heaven.' And in the Tandya Brâhmana:—"The lord of creatures offered himself a sacrifice for the gods.' . . . And again in the Satapatha Brâhmana:—'He who, knowing this, sacrifices with the Purusha-madha or the sacrifice of the primeval male, be comes everything.'. . .
“The origin of all religions—Judaeo-Christianity included—is to be found in a few primeval truths, not one of which can be explained apart from all the others, as each is a complement of the rest in some one detail. And they are all, more or less, broken rays of the same Sun of truth, and their beginnings have to be sought in the archaic records of the Wisdom-religion. Without the light of the latter, the greatest scholars can see but the skeletons thereof covered with masks of fancy, and based mostly on personified Zodiacal signs. “A thick film of allegory and blinds, the ‘dark sayings’ of fiction and parable, thus covers the original esoteric texts from which the New Testament—as now known—was compiled. Whence, then, the Gospels, the life of Jesus of Nazareth? Has it not been repeatedly stated that no human, mortal brain could have invented the life of the Jewish Reformer, followed by the awful drama on Calvary? We say, on the authority of the esoteric Eastern School, that all this came from the Gnostics, as far as the name Christos and the astronomico-mystical allegories are concerned, and from the writings of the ancient Tanaïm as regards the Kabalistic connection of Jesus or Joshua, with the Biblical personifications. One of these is the mystic esoteric name of Jehovah—not the present fanciful God of the profane Jews ignorant of their own mysteries, the God accepted by the still more ignorant Christians—but the compound Jehovah of the pagan Initiation. This is proven very plainly by the glyphs or mystic combinations of various signs which have survived to this day in the Roman Catholic hieroglyphics. Is this also the agenda of Point Loma Nazarene University and its famous alumnus, Dr. James Dobson of Focus on the Family? Might this be the reason Dr. Dobson invited representatives of the Liberal Catholic Church to meet with America’s leading pastors at Focus on the Family? Could this be the reason Point Loma Professors Participate in Oxford Institute, and that many activities of the World Methodist Council, to which PLNU belongs, are undertaken through auxiliaries such as the Oxford Institute—which was founded by the Ancient Order of Druids, was the center for the Oxford Movement, the 19the century Counter-Reformation in England, and has been the training center for Rhodes Scholars who are funded by the Rothschild family for the purpose of creating a New World Order and One World Religion? And might this be the reason Point Loma Nazarene University, which claims to be a Christian institution, has an extensive historical presentation of the Theosophical Society on its website? The PLNU “Campus Tour,” a portion of which is copied below, reads like a tribute to the Theosophical Society; there is no disclaimer of affiliation with the Society or identification of Theosophy as an occult, anti-Christian pagan belief system. There was history on the peninsula before PLNU called it home. Conceive of a community, in which . . . the perfect personalities . . . meet . . . in some pleasant western settlement or town. I can conceive such a community organized in running order, powers judiciously delegated--- farming, building, trade, courts, mails, schools, elections, all attended to; and then the rest of life, the main thing, freely branching and blossoming in each individual, and bearing golden fruit." These words of Walt Whitman describe the mood of optimism that inspired the creation of a number of utopian communities in the western United States in the 1890s. One of these was the community of Theosophists that lived in Lomaland (the present site of Point Loma Nazarene University) until 1942. 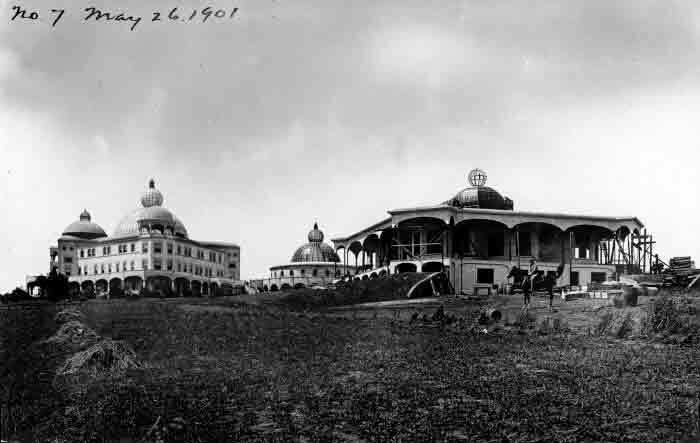 The Theosophical Society began its settlement on the barren and windswept slopes of Point Loma in 1896. 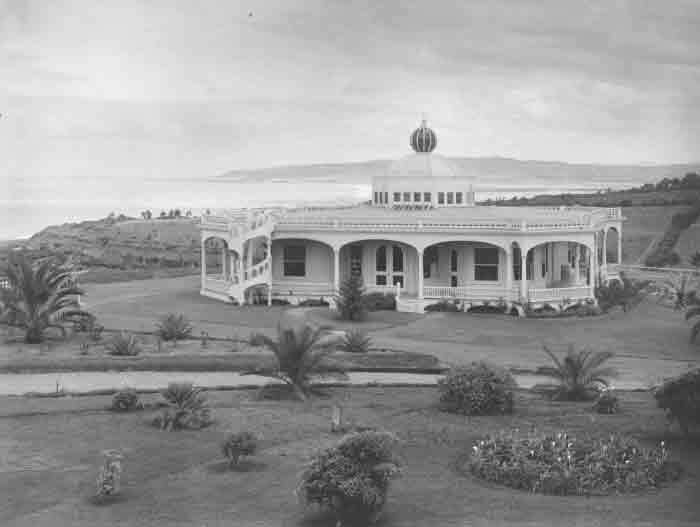 Led by Katherine Tingley, the group came to Point Loma to establish a community that would model the philosophical and humanitarian goals of Theosophy. The "White City" envisioned by Tingley was to be located on the extreme western edge of the North American continent but oriented toward India, the spiritual center of Theosophical beliefs. The blend of new world confidence, Victorian morality, a love of antiquity, and Indian spirituality created a unique community that found its expression in architecture that is still visible on the campus of Point Loma Nazarene University. 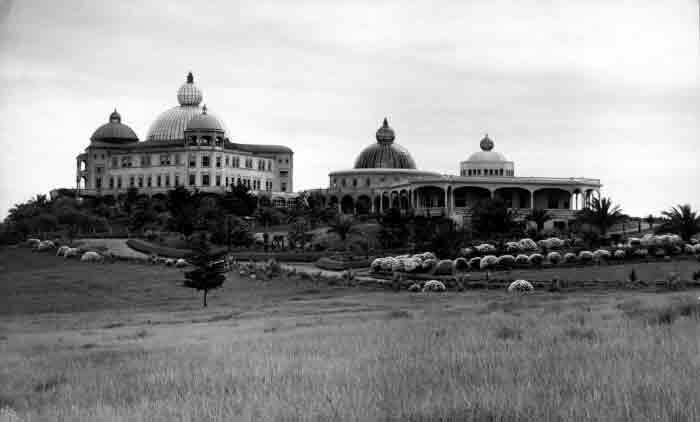 By 1900, the campus was dominated by the imposing Academy Building and the adjoining Temple of Peace. Both buildings were constructed in the Theosophical vernacular that included the flattened arch motif and whimsical references to antiquity. 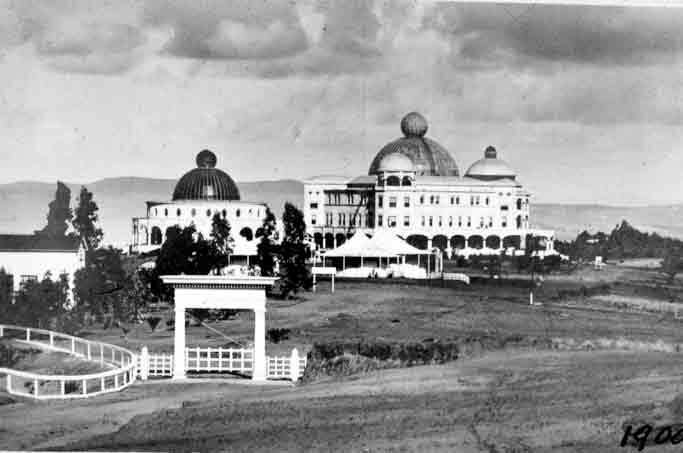 The buildings were topped by amethyst domes, which were lighted at night and could be seen offshore. 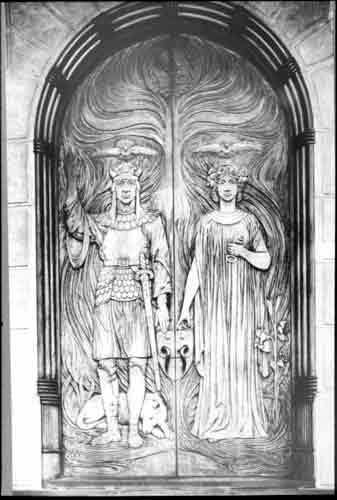 The entrance to the Academy Building was dominated by two massive carved doors that symbolized the Theosophical Principles of spiritual enlightenment and human potential. These doors are currently located in the archives of the San Diego Historical Society. The sculptor, Reginald Machell, was educated in England, but moved to Lomaland with the community in 1896. The interior furnishings he carved for the Academy Building were influenced by the Symbolist style popular in Europe at that time. Machell also supervised the woodworking school at Point Loma. The Academy Building and Temple of Peace were situated on the approximate location of the Brown Chapel on the PLNU campus today. The campus was bordered on the east by what is now Catalina Boulevard and had two entrance gates, the Roman Gate pictured here and the Egyptian Gate, which provided direct public access to the Greek Theatre (now Dupont Street). The entrance driveway (now Lomaland Drive) went west toward the main Academy building. Lomaland had public buildings for the entire community and several private homes. The home of Albert G. Spalding, the sporting goods tycoon, was built in 1901. The building combines late-Victorian wooden architecture with historical motifs such as the modified Corinthian column (now shaped like a papyrus leaf) and flattened arches. The amethyst dome was restored by a team of scholars led by Dr. Dwayne Little of the Department of History and Political Science in 1983. The wood trim inside the Spalding home was the work of the sculptor Reginald Machell. Machell's Symbolist style attempted to give form to Theosophical principles; the repeated octagonal floor plan oriented around the central dome symbolized the perfection of the universe. 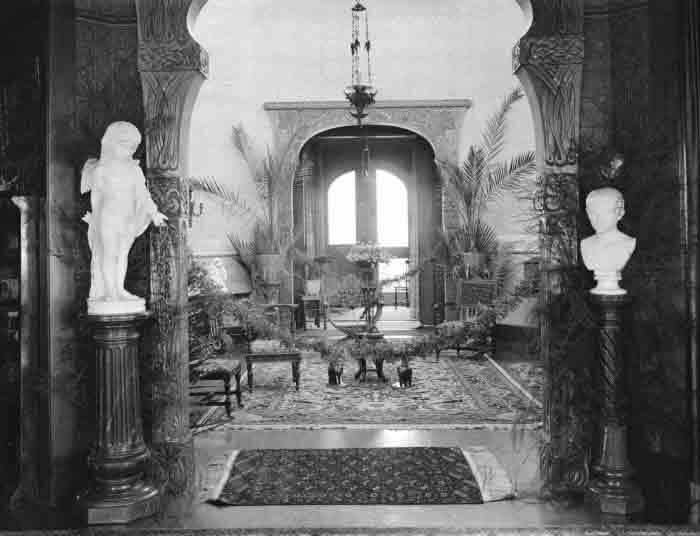 The interior decor of the Spalding home was typically late-Victorian. References to classical antiquity are mixed with ornate, manufactured domestic furniture items. This mixture of furnishings is a sharp contrast to the deeply-carved geometry of the doorjambs and the whitewashed purity of the interior dome. 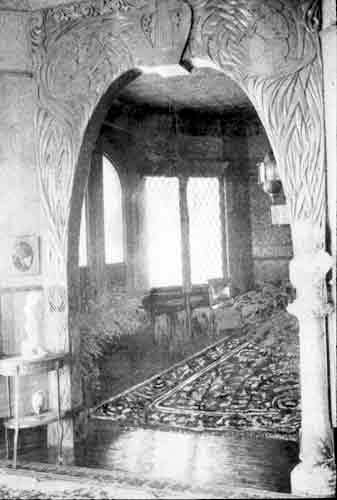 An important component of Theosophical Design was to move in the direction of the arts and crafts reform and a rejection of the overly-decorated interior. Several designers in the emerging modernist movement, such as Piet Mondrian and Wassily Kandisky, were influenced by Theosophy. Built in 1901, this was the first Greek amphitheater in North America. It was used for sporting events and theatrical performances. The tessellated pavement and stoa were added in 1909. The theatre was the site of a number of productions of Greek and Shakespearean dramas. The educational arm of Lomaland was the Raja Yoga Academy, established in 1901. "Raja Yoga" meant divine union, and the educational goals of the school involved not only intellectual formation but also moral and spiritual development. The Raja Yoga Academy was a boarding school; students lived together in group homes that were know as "Lotus Houses." This view of the Lotus houses looks south from the Academy Building. 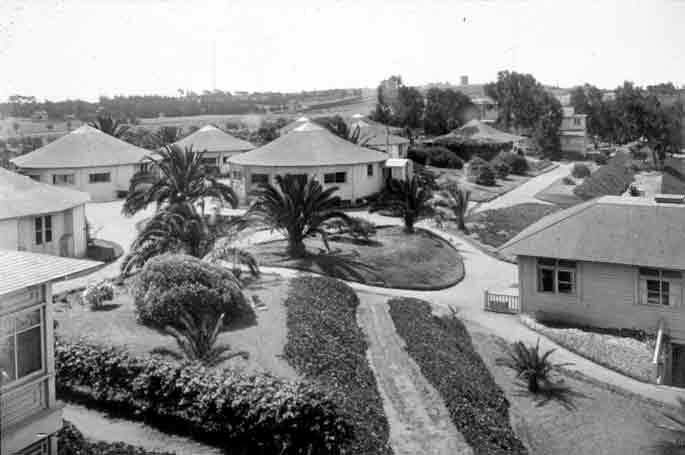 Only one of these homes remains on the PLNU campus today; the square-shaped Group Home #9 is visible in the distance at the middle of this image. It currently stands behind Cabrillo Hall at the Dupont Street entrance to campus. Point Loma Nazarene University is obviously proud of its pagan predecessor, the Theosophical Society. PLNU’s “Campus Tour” gives their student body and prospective students, no warning to have no fellowship with this evil work of darkness, but rather an appreciation for all things Theosophical — Indian spirituality (Hinduism), Raja Yoga, the esoteric principles of spiritual enlightenment and human potential, Gnosticism, etc. What has been the fruit of Point Loma’s subtle promotion of Theosophy? PLNU is now openly embracing Emergent Church leaders, such as Rob Bell, who brazenly reject Bible doctrine and promote all things Theosophical — Indian spirituality (Hinduism), Yoga, Buddhism, the esoteric principles of spiritual enlightenment and human potential, Gnosticism, etc. “...in all of my studies and hours of listening to him in his own words, I have never read about or heard him say anything regarding the need for repentance of sins or that Jesus died in our place to take the punishment for our sins. “The theology of this false gospel is based on the theories of Buddhist philosophers, Ken Wilber, the worldviews of Stanley Grenz, Wolfhart Pannenberg, LeRon Shults and in German theologian Jurgen Moltmann’s ‘theology of hope’, developed from the philosophy of Friedrich Hegel, Karl Barth and Rudolph Bultman. 1. Good works – helping to eradicate poverty and suffering, working to restore the environment, calling for an end to war, etc. 2. Engaging in contemplative, mystical experiences that ‘connect’ one to God in higher ways than the intellect will allow. “Thus, everyone who adheres to these practices achieves salvation by working together to help the world and everything in it evolve. In this theology, Scripture does not convey a fixed meaning determined by Holy Spirit-inspired authors. Instead, spiritual experiences become the true source of meaning for individuals and groups of people. Therefore, God’s commands are no longer universally binding. Christ was crucified not because he was the sacrifice for our sins but because the world rejected His message of love. According to this view, the resurrection is merely a view of history with a hopeful future. Hell and heaven are not experienced in the hereafter but are part of the human condition in this life. There is no need for repentance of sins and no future judgment. Christ may be the best way to God, but He is not the only way. Everyone will eventually be saved and live together on this present earth in peace and unity. The apostasy of Point Loma Nazarene University did not occur spontaneously, from some inexplicable cause. PLNU carries the genetic traits of the heretical progenitor it now resembles — the Theosophical Society. The Lord Jesus was not giving His disciples a lesson on horticulture, but a spiritual principle by which to form their opinions of spiritual leaders: “Beware of false prophets, which come to you in sheep’s clothing, but inwardly they are ravening wolves.” (v.15) Since the spiritual tree of Theosophy is corrupt, we may safely assume that the spiritual fruit it has produced — PLNU and its offspring, James Dobson and Focus on the Family — have the same spiritual nature.